In this fun, informative, refreshingly irreverent and hilariously illustrated "Tell All", you'll get everything you've seen during your Free Online Tour... plus Much, MUCH MORE !! BUY OUR NEW 10TH EDITION! Special Online Price Now Only $9.95! A great gift for anybody whose life is made a living hell by a Bonehead Boss! Bonehead Bosses | Don't Fear the Inferior! 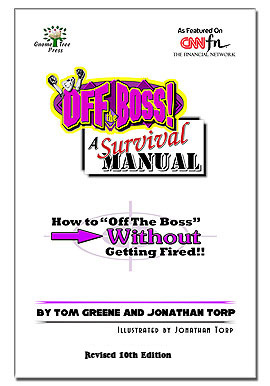 OFF THE BOSS - The TV Show! The Inner Boss | Send Your Boss an OFF THE BOSS Postcard! OFF THE BOSS Online © 2006, All Rights Reserved. OFF THE BOSS Online is strictly prohibited.